Unless you live on another planet, then you are familiar with the extreme popularity of the Angry Birds game. 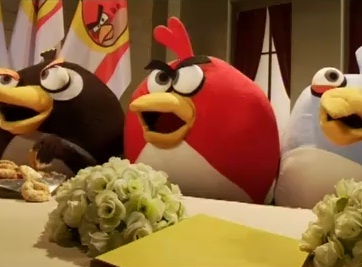 As an example of how popular it truly is, here is a funny Angry Birds TV sketch. This Angry Birds sketch from Keshet TV is an attempt to come up with a Peace Treaty between the Angry Birds and the Green pigs. What results is a lot of color, havoc and even a real life Angry Birds game as an example. If you are a huge fan of the game, then you should also check out the Angry Birds cakes, the hilarious Angry Birds Costumes or even the Angry Birds iPhone cases. Pingback: Angry Birds for Android (full) now available.